Where can I buy a highlighter that let me see what I am highlighting? If you have ever had any troubles highlighting some text, this unique see through tip eliminates blind spots so you can see what you’re highlighting as you mark for straighter lines and more precise highlighting. You can buy a really cheap set of 4 colored highlighters includes 1 each of yellow, orange, pink, and green. For less than $6! These markers don’t bleed through the page, which is nice. The only problem with these, is that they are a bit shorter than regular highlighters. 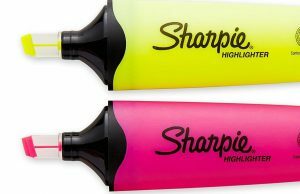 But if you have a compulsion for the way a straight highlight line looks, these are perfect for you! This entry was posted in Anything else and tagged colors, green, highlighter, highlighting, line, markers, remark, sharpie, sharps, study text, text, yellow on February 2, 2016 by WhereCanWeBuy.